Okay; the title of the post is a bit tongue in cheek! Since it was first announced that the new project.json format (developed by the ASP.NET Core team) was going to be retired in favour of the more traditional csproj file, the .NET community have had some very strong opinions. These have been shared on Twitter, in blog posts, on GitHub and via any other channels people could find. I will admit that when I heard about the change, I initially had some of the same views and concerns. Why would Microsoft take away my beloved project.json? However, I decided to wait it out and see what Microsoft actually produced before passing judgement. Let me take a step back here and try to explain a little bit of the history as I have understood it. 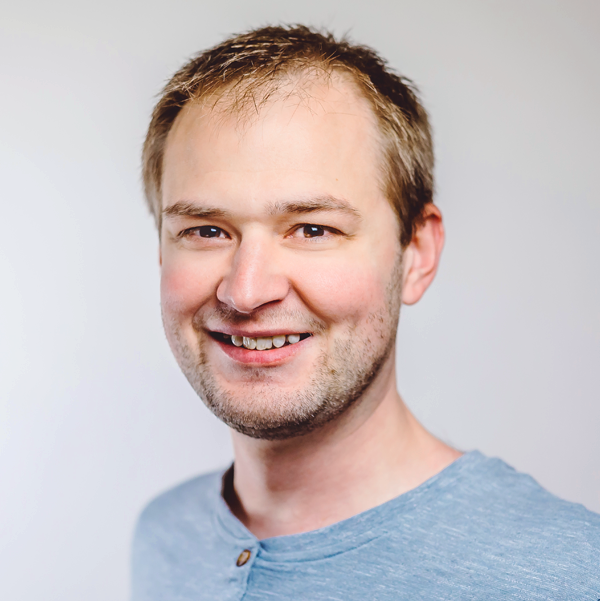 In the early beta timeframe for ASP.NET Core (then called ASP.NET 5) the ASP.NET and .NET teams were working independently of one another. 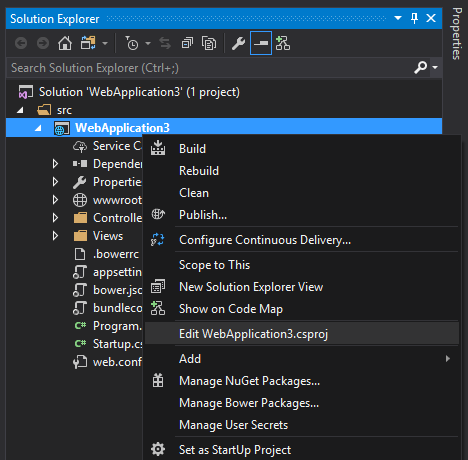 The .NET team were working heavily on the API surface for .NET Core, whilst the ASP.NET team were working on the ASP.NET Core application platform on top of the API the .NET team were making. The tooling to work with ASP.NET Core was in an early preview and at the time we had DNVM and DNU commands. These have since been consolidated and morphed to form the dotnet CLI. In order to support development of ASP.NET projects, the team decided to take the opportunity to develop a brand new project file format. One which would be simpler and address many of the issues the community had experienced when working with csproj based projects. At the time, nothing existed specifically for .NET Core projects and it was felt that since ASP.NET Core represented a new beginning for the platform, it was as good a time as any to make changes. During the betas and release candidates people started to get their hands on the new project.json and xproj based solutions when building their web applications. The response was indeed very positive. project.json provided autocomplete of dependencies, ease of reading and a much simpler overall structure. Personally, I was very pleased when project.json was born. I could easily understand it and it became a regular reference point to review my dependencies and manage my projects. However, it was during the release candidate period that decisions started to get made around a wider .NET project format for the other application types. Customers were starting to share their concerns around project.json and the fact that it was not supported within MSBuild. What would this mean for large monolith projects, how would they even begin to migrate them to .NET Core? And, being fair, these were valid concerns. Starting with greenfield ASP.NET Core projects was fantastic. There was no need to concern ourselves with the past and the new new project.json was easy to get to grips with. But, working with an existing project would not necessarily be a simple conversion without some degree of work. So the announcements started to be made that project.json would be retired in favour of a more backwards compatible MSBuild ready, csproj format. It was too late in the day for this work to be completed before the RTM of ASP.NET Core 1.0 but we were warned that it would be worked on for release alongside Visual Studio 2017. And that brings us to today, with the announcement of the release candidate for Visual Studio 2017 we can now get our hands on projects using the new (or should I say old) csproj project format. I’ve taken an early peek at the file to see what has changed. Microsoft have assured us while working on the change that they expected to port many of the improvements that the project.json file gave developers over to the improved csproj format. 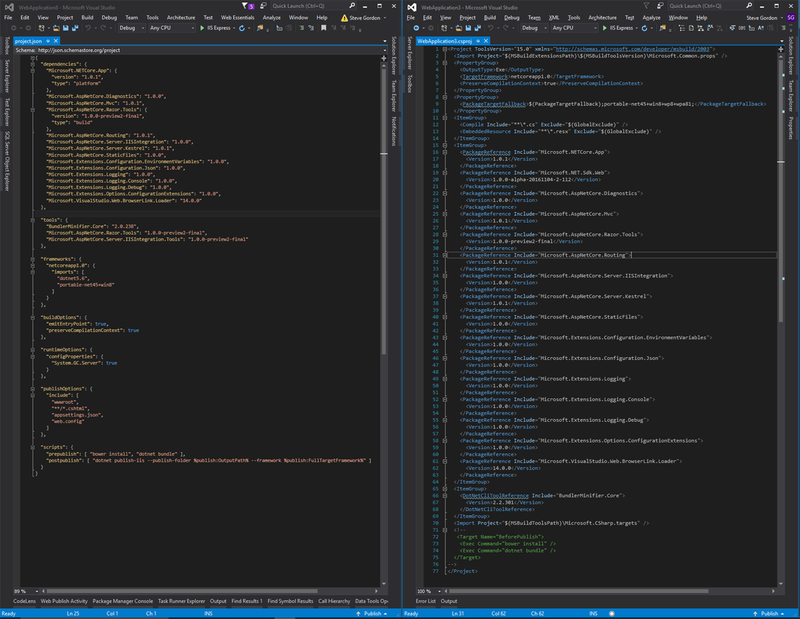 In the screenshot above (hard to see due to the size) I’ve opened a default new Web Application project in VS 2015 (left) and VS 2017 (right). Side-by-side the obvious difference in that project.json is JSON and the csproj is XML. You will notice that the line length of the files is not too different. project.json comes in at 65 lines and csproj comes in at 77 lines. Already that is a significant reduction in lines from a traditional csproj file. The other thing which stands out to me is the readability. Despite the work Microsoft have done to reduce noise in the csproj file, I still find it much harder to scan than the project.json. The XML tags draw my eye away from the detail that I actually want to consume. 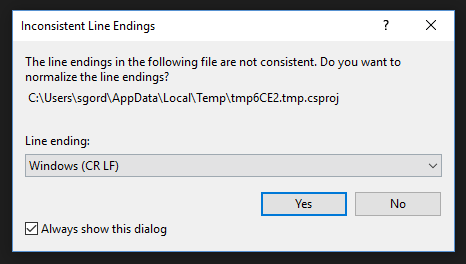 At the time of writing I’m still very new to working inside VS 2017 and indeed on my computer it’s proofing quite buggy. For example, a solution that I created inside VS 2017 and which had been working fine (1 web application and 1 test class library) no longer re-opens after I saved and closed it. Suffice to say, I won’t be using Visual Studio 2017 for production work at this time and may even remove it entirely as it seems to be affecting my experience inside VS 2015 too. Once nice advantage of the csproj file over the project.json is that we can now include references to full (non-core) .NET projects as well. Previously the integration was not available. Something I do miss however (unless it’s just not working for me) is proper autocomplete of the packages and versions. With the project.json I could start typing the name of a dependency and Visual Studio would show me potential autocomplete options. I could also choose from the available versions. This seems to be absent in the csproj file. Personally I only saw basic intellisense for some, but not all, of the xml tags. Migration from project.json can be achieved in one of two ways. These easiest is to open the existing xproj/project.json project inside Visual Studio 2017. The IDE will detect the project format and prompt for a migration. The other option is to run the dotnet migrate command directly in the command line. This should result in the same conversion. In a quick test for me, the VS migration seemed to work quite well, although that was a single default web application project with basic dependencies. In theory it should work just as well for larger projects. Perhaps when we come to migrate the allReady project which I contribute to, we’ll see if there’s more to it. Having done this with the project.json solution created in VS 2015 (as appeared above) we get the following csproj output. Inside the project.json we have our main dependencies section and inside that we define the package and version. This is pretty clear and easy to read. Inside the csproj each package reference is added inside an ItemGroup element. It’s more verbose than the project.json. Much of the content is similar and when you compare the files you can generally find where each part has been migrated. However you’ll need to remember the more complex XML schema in order to edit the file manually. Indeed, Microsoft seem to be pushing us away from this in favour of IDE tooling and the command line. I fear though, that those are never going to be as quick to work with as we’ve been used to with a quick edit of the project.json file. There are some other notable changes between what we see in a traditional csproj file when compared to the newer csproj file. Firstly they have gotten rid of the use of GUIDS within the file, so that it is much more human readable. That’s a good change and one I’m happy to see. We are no longer required to include all of the files within the csproj file in order for them to be considered part of the project. project.json gave us a much more favourable, include by default, behaviour and this has now been made available inside csproj. It’s ever so slightly different as we must use a wildcard style include line to tell the project to behave this way. 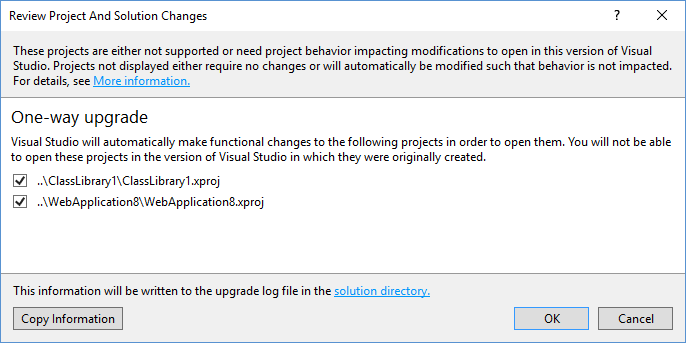 New projects created inside VS 2017 have this by default. When working with teams of developers, the csproj file was a common area of merge conflicts. We should no longer have so many issues since the project file will not change simply because we’ve added new files to the project. Package references are now integrated into csproj so this single file also includes any libraries our project is dependent on and any projects we reference. It’s nice to have everything in one place as we’ve become used to with the project.json format. Another important change is that we can now edit the csproj file whilst the project is loaded. This was not previously possible and meant that any manual changes were slow to make as we had to first unload the project. Granted, it was rare that I wanted to manually edit the file in the full .NET framework days. To edit the csproj file we can simply right click on the project without unloading it first. One gripe at this point that I experienced is a warning for inconsistent line endings every time I edit the csproj file. As well as the direct differences inside the file, there’s a few initial tooling differences I wanted to highlight between VS 2015 and VS 2017 that I’ve noticed. The main one I’ve seen so far is the consolidated dependencies folder. Before, we had a “References” folder which included any dependent libraries we added via Nuget and any project references. We then had a “Dependencies” folder which included Bower dependencies. Inside Visual Studio 2017 these have been placed together inside a single “Dependencies” container. 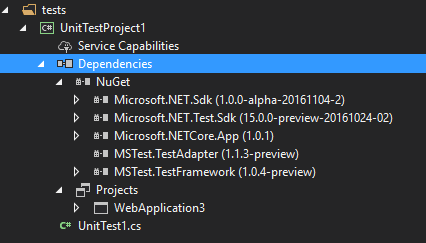 Project references have their own sub-container to separate them from the Nuget dependencies. I definitely don’t find the XML as readable as the JSON for reviewing the configuration of my project. This will improve with time as I get used to it, but there’s still too much noise in the file for my liking. It’s certainly a big improvement on the traditional csproj format though and the wildcard include of files is an important enhancement. Personally, I still much prefer the project.json format and whilst I understand the business case the led Microsoft to their change of course, I feel it’s a shame the MSBuild system couldn’t have moved with the times, rather than dropping back to the xml based project file. The lack of autocomplete for dependencies bothers me too. This was really handy and I could quickly build up my dependencies without having to open up the Nuget package manager each time. It feels like we’re now being forced down that route which proves to be a bit slower and less efficient. It’s still very early days and I need to spend more time with the new version of csproj in a final stable version of VS 2017 before passing a final judgement. 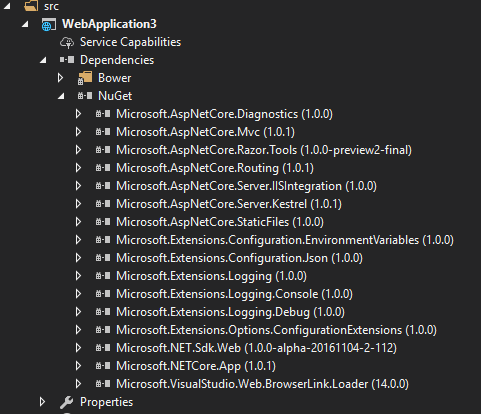 We also have to remember that the .NET SDK tooling is not quite fully baked yet either. At this early point I’m running into quite a few issues running VS 2017 so it’s hard to fully appreciate the final experience. The Microsoft statements suggest that in reality the tooling and command line interface should negate the need to spend much, if any, time editing the csproj manually. Once everything is complete we will be in a better place to judge for ourselves. I can’t help but assume things will end up being slower overall and that I’ll end up missing the ease of the project.json file. After reviewing https://blogs.msdn.microsoft.com/dotnet/2016/10/19/net-core-tooling-in-visual-studio-15/ I can see that the format for the new csproj that I have experienced in VS 2017 RC doesn’t match the example of what I presume is the end goal. So it’s entirely possible that the structure will evolve even more before release. The example in the MSDN blog does look cleaner and much less cluttered so I will watch this space with interest.